3. Combine this powder with your cream or lotion, preferably 20 minutes before leaving the house. You can also combine the powder with some essential oils and apply on your face, if you want to use a natural sunscreen. Pomegranate peels contain healing qualities which efficiently combat pimples, acne and rashes. Its peels are loaded with antioxidants that help to keep bacteria along with other infections away. 1. Roast a handful of sun-dried pomegranate peels over a deep-bottomed pan. 3. Grind them using a mixer or grinder. 4. Make a paste of this powder using lemon juice or rose water. 5. Apply all over your face, most especially on your acne and pimples. 6. Let it dry for a while. 7. Wash thoroughly with lukewarm water. 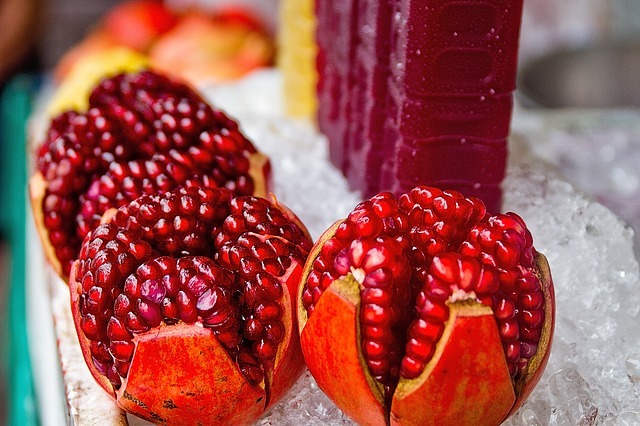 Research suggests that pomegranate peel extracts when mixed with seed oil allows procollagen synthesis, prevent enzymes which break down collagen and encourages skin cell growth. These naturally and effectively delays skin aging and wrinkles. 1. Add a little milk and two spoonfuls of sun-dried and powdered peel. You can add rose water to the powder instead of milk and make a mixture out of it, if have oily skin. 2. Apply the mixture on your face and leave on till it dries. 3. Wash your face using lukewarm water. Try using the powder mixture at least twice a week for best results. Pomegranate peels can help prevent hair loss and dandruff. 1. Combine dried-pomegranate peel powder with your hair oil. 2. Apply on the roots of your hair and massage thoroughly. 3. You can wash your hair using a mild shampoo after 2 hours of the application or you keep it overnight as per your preference or covenience. Pomegranate peels are perfect for your skin. It hydrates the skin from pollutants and other environmental toxins. Also, it reinstates the pH balance of the skin. This is due to the ellagic acid present in the peels, which lock moisture within the skin, thus keeping it soft and supple. 1. Using a mixer, grind sun-dried pomegranate peels. 2. Place the powder in a clean bowl. Make enough powder to last you for a week and place it in an airtight container. 3. Take two spoonfuls of the powder and combine well with some yogurt to make a mixture out of it. 4. Apply the paste on your face and neck. 6. Wash off using cold water. Pomegranate peels help in eliminating white heads, black heads and dead skin from the face whenever utilized in form of a facial scrub. 1. Combine two spoonfuls of sun-dried pomegranate powder and one spoon of brown sugar. 2. Make a paste. Then add one spoon of avocado oil or any essential oil of your choice and one spoon of honey. 4. Scrub your face using the homemade scrub and massage thoroughly. 5. Wash off using water. Don’t forget to use a moisturizer and toner after scrubbing.